Realistic Games is an online slots development company which, unsurprisingly, has a strong track record of producing games which look and feel like the real thing. Bullseye is one more to add to the list and it’s a basic three reel offering which may not appeal to those who prefer bonus features. 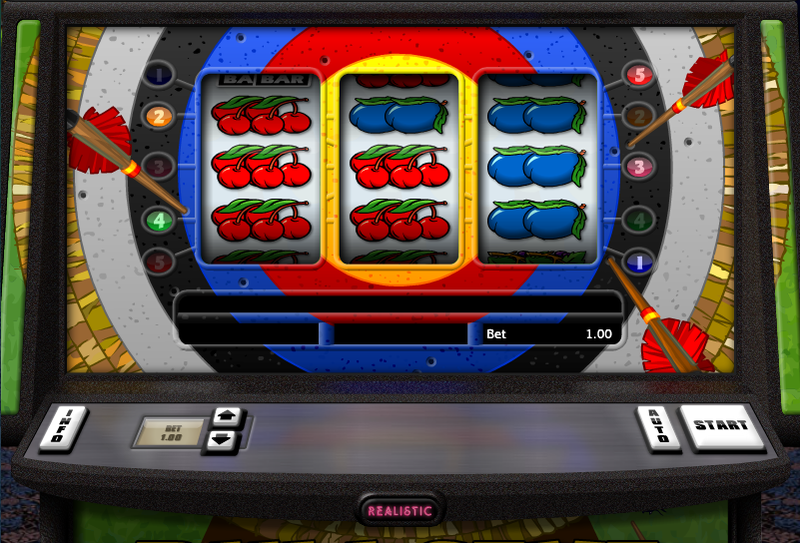 However it’s a colourful and high quality slot which is well worth checking out. 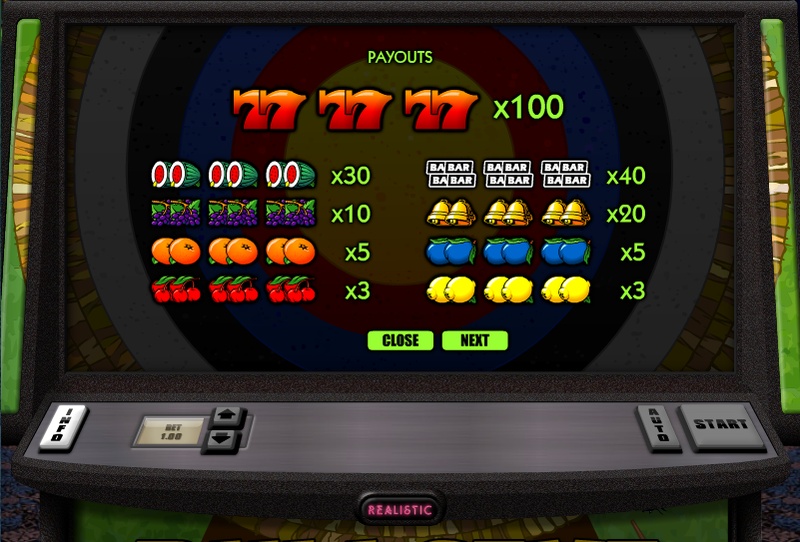 Bullseye is a three reel and five payline game with the sporting theme of archery; the reels are centred on an archery board with the different-coloured concentric rings spreading out from the centre. As a nice addition, three slightly inaccurate arrows are stuck in the target. The symbols are of the traditional fruity variety plus a couple of others and so we have lemons, plums, cherries, oranges, grapes and melons, bells, bars and sevens. The sevens are the most valuable symbols and worth 100x your stake. Five paylines full of sevens will therefore pay you 500x your stake, not a bad return. To get started all you need to do is choose your stake by using the arrow buttons in the bottom left hand corner; the five paylines are fixed so the amount you choose is your total bet. Unusually for a three reel slot, Bullseye has a small bonus feature called Full House. It will occur when the symbol in the centre position in reel two is surrounded by symbols which match each other. Every symbol on the reels will then change to match that lone central one, meaning a minimum payout of 15x your stake all the way up to 500x. Bullseye is actually quite an addictive game to play, probably because of the high quality of the graphics and the smooth spinning of the reels. Even if you’re not too keen on three reel slots, we would recommend checking this one out.